Andrew Christopher "Drew" Brees (pronounced /ˈbriːs/; born January 15, 1979) is a quarterback for the New Orleans Saints of the National Football League. He was drafted by the San Diego Chargers in the second round of the 2001 NFL Draft. He played college football at Purdue. 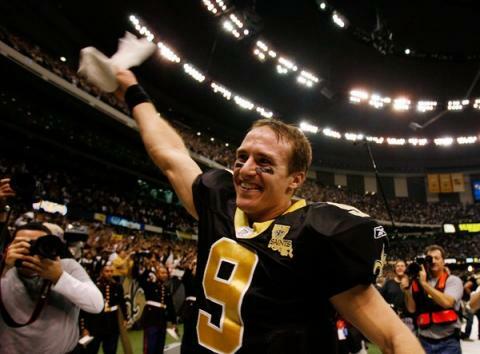 Brees has been selected to the Pro Bowl five times in his career – with the Chargers in 2004 and th e Saints in 2006, 2008, 2009, and 2010. He was named the NFL's Comeback Player of the Year in 2004, the Offensive Player of the Year in 2008, and the MVP of Super Bowl XLIV. He was also selected by voters to appear on the cover of Electronic Arts' Madden NFL 11. Sports Illustrated named him as its 2010 Sportsman of the Year.